What's the first thing to consider looking for living room curtain design ideas? The impact their design, texture and colours will have on the rest of the space – and your windows in particular. After that, you have two further options when buying curtains: ready to hang or made-to-measure; we have found the best of each to give you inspiration for dressing your living room windows. If you need more inspiration for your space, find the best living room window treatment designs; and discover more window treatments for all your rooms on our dedicated page. Large prints and brighter shades tend to look more contemporary and draw attention – perfect if you want to make a focal point of a beautiful window. Smaller prints and paler colours will have a subtler, more traditional effect, allowing other furnishings to take the spotlight. Find more pretty window dressing ideas for period homes in our design guide. 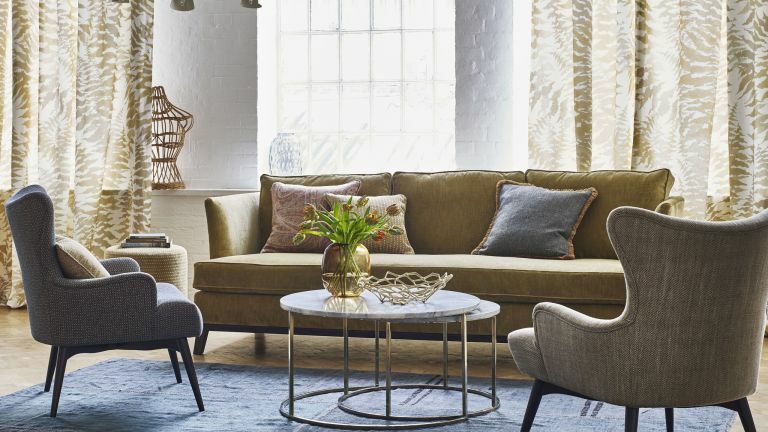 Fabric choice is key: heavier fabrics aren't just ideal for colder months or draughty rooms, they will make a living room feel cosy and inviting all year round. Wispy sheers, by contrast, will filter out bright sunlight in summer but allow light in during even the greyest of days – ideal for making a north-facing living room feel brighter. For more tips, find out how to design a north-facing living room. 3. Do your curtains need to provide privacy? Do you need your living room window dressings to provide privacy, too? If so, consider matching them with sheer panels, blinds or shutters; this has the added bonus of creating a luxurious, layered look. When choosing curtains, you will want to consider your window's shape as well as its size. If you’ve got a bay window, the curtains will need to be a little bit wider to fit all the way around, and if you’ve got tall windows, don’t forget to measure the length and choose curtains at least a few inches longer than the window itself. Hanging curtains at a living room window that finishes at waist height? Take them to the floor for a modern look that exaggerates your window's proportions. 5. Will your curtains keep out the light and cold? Think about the function of your living room curtains, as well as what they look like. Is it particularly cold in your living room? If so, lined curtains will help insulate the room, and work as blackout curtains. If you have a north-facing living room or if it's dimly lit you will want to go for light, sheer curtains that diffuse natural light. Find more inspiring glazed door treatments in our design gallery. Check what type of curtain top you need. Pencil pleat curtains come with little hooks, which although are a little frustrating to fasten in place, allow for a neat and uniform drape across the window. If you have a curtain rail, then you can choose to go for curtains with eyelets, which are much easier to hang, but must be the right length to avoid pockets of light appearing at the top of the window. 7. Which style – contemporary or traditional? The rest is down to style. If your living room is fairly neutral, then you can afford to go for bold patterns and colours, and create a focal point in your living room. But if you prefer to keep things simple, then opt for colours that complement your overall colour scheme. Ideal for both modern living rooms and more traditional spaces, the Ordesa fabric from the Andalucia collection by ILIV is inspired by watercolours of forest scenes. The hand-drawn, digital print on co-ordinated velvets and weaves gives this fabric a lovely weight, so it hangs perfectly. Shown here in Jade, the ideal shade for linking indoors with the garden, they also come in Carbon, Mulberry and Sapphire, and cost from £19.35 per metre. If your living room is east- or north-facing, it's likely to suffer from a lack of natural daylight. Hanging a pale-coloured curtain fabric can boost light levels, while a delicate pattern like this will create a restful feel. Picking out the fabric's bolder accent colours in cushions and upholstery will give the space a more contemporary finish. Inspired by Japanese blossom branches, this Floris Soleil silk blend curtain fabric from Romo is £95 per metre and comes in four colourways. Velvet curtains hang beautifully due to their weight, have a sumptuous sheen and a tactile quality that will give even a small living room window an opulent feel. Maximise the living room's light levels by fitting a long enough pole or track to ensure they pull right back to the edge of the window's frame when open. Curtains 2 Go's Premium Velvet Royal Blue made-to-measure curtains have a light-filtering lining as standard; there's also a blackout option, perfect for bedrooms. Prices start from £56.45 per pair. Stripes are a classic design that are easy to match with other motifs for a layered scheme. Wider stripes tend to create a more traditional finish; pencil thin stripes are more contemporary-looking. Multi-coloured designs like this give you lots of options for updating your scheme in the future – simply pick two or three shades from the design and echo them in accessories and furniture in different proportions. Mikado curtain fabric, £82 per metre from James Hare. Want to draw attention to a large window or beautiful view? A bold print at your windows will give your living room a focal point. And, if you’re a big fan of Mid-century modern style, you’ll love these Elements Emmott ochre eyelet curtains from £20, Dunelm. There are nine sizes to choose from and they come ready to hang with a modern eyelet header. Team them with grey, ochre and white accessories to complete the look. Bold living room colour schemes have made a definite comeback, and an easy way to achieve this is by hanging curtains and sheers in the same strong shade. Put them in a neutral room to make a feature of the window wall, or match your walls' paint colour to the fabric for maximum impact. These Mariam orange eyelet curtains, £18 a pair at Ikea, are teamed with their Hildrun pink dotted sheer curtains with a slot heading, £6 a pair. Both come ready to hang. If you want your living room to look smart and formal, choose a fabric with a graphic repeat design and ensure the curtains finish at floor level rather than drape down on to it. Pick a wall paint colour that complements rather than contrasts with the curtains for a tranquil feel. These cotton-mix Studio G Castello geometric jacquard curtains in indigo are available in nine sizes with an eyelet header. Also available in Charcoal and Mushroom, and with matching cushions. Prices start from £69 a pair. Large-print fabrics inspired by nature are an interiors trend that shows no sign of going away, with this subtle Fern print in Sandstone by George Spencer Designs, £144 per metre, an easy to live with choice for contemporary and traditional living rooms alike. Create a restful living space by coordinating the curtains with furniture in similar, natural colour tones, and add a touch of glamour with accessories in gold and amber. Looking for more living inspiration?